The Witches collection of autumn/winter 1983 was Vivienne Westwood and Malcolm McLaren’s final collaboration. It came following a trip to America to meet Keith Haring, whose fluorescent, graffiti-inspired designs would feature on a number of the pieces. The collection was influenced by Haring’s ‘magical, esoteric sign language’ (which also inspired its eerie name) and early-1980s American hip-hop culture. McLaren at the time was greatly interested by hip-hop; Witches followed only months after the release of his solo album Duck Rock (which featured artwork by Haring), a milestone in the popularisation of hip-hop in the UK. Witches was shown on the catwalk accompanied by strobe lighting, to give a dislocating, freeze-frame effect to the models, and a soundtrack of rap music. The trenchcoat is one of the ‘classic’ styles of the 20th century, born as a practical, waterproof garment for officers in the First World War. This exaggeratedly-cut unisex ‘mac’ is simply constructed from rectangles of waterproofed cotton. It showcases both Westwood’s cutting skills and her interest in ‘classic’ and historical menswear, something first explored in the Pirates collection of 1980. 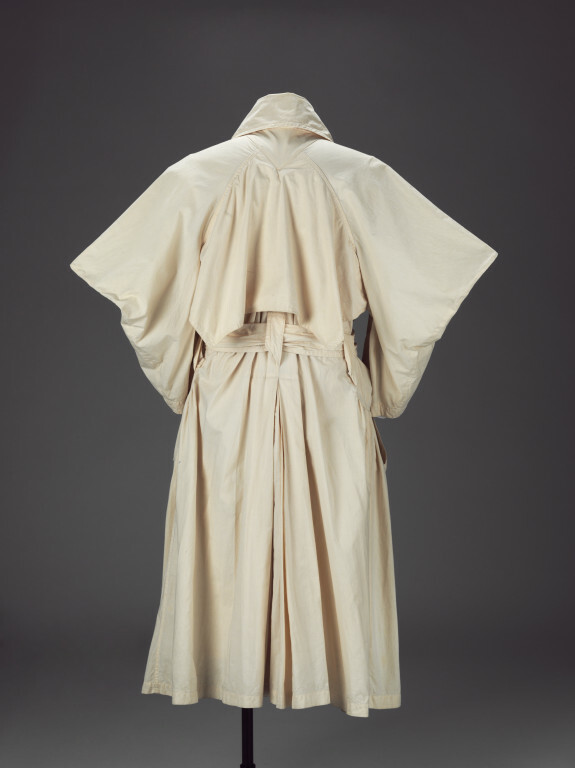 Many of Westwood and McLaren’s collections featured outsized clothing at a time when a fitted, masculine silhouette was mostly favoured. 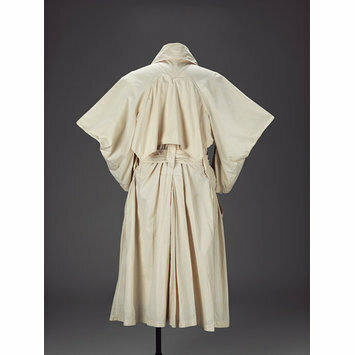 Large cream cotton raincoat and belt, with waterproofing. Exaggeratedly outsize cut. Purchased by Rupert Michael Dolan in March 1984 at a sale at Vivienne Westwood and Malcolm McLaren's outlet store, Nostalgia of Mud, located at Christopher Place in the West End of London. It was given to the V&A in 1991 (Registered File number 1991/2009).